Little Mermaid was lifted from the harbor, boxed, and shipped to Shanghai where she is the star guest in the Danish Pavilion at EXPO 2010 which runs until October 31. For nearly 100 years, the heartbroken Little Mermaid has sat on a rock looking out over Copenhagen& #39;s port but now the sculpture based on the famous fairytale, is heading back out to sea, set for China. The small bronze statue inspired by the tale of author Hans Christian Andersen and unveiled in 1913, is a major tourist attraction in Copenhagen. But her life has not always been easy. She has been beheaded twice, had her arm cut off, was blown off her rock in 2003 and was dressed in a Muslim headscarf two years ago in a protest - but she never left her native country. This week she was lifted from the harbor, boxed, and shipped to Shanghai where she is the star guest in the Danish Pavilion at EXPO 2010 which runs until October 31. Details over her trip were not revealed due to security issues. "The Little Mermaid," published in 1837, is a sad story about a mermaid who falls in love with a prince and gives up her life in the sea and her tail for legs. The fairytale has been adapted many times into stage shows and into a Disney movie. Copenhagen mayor Frank Jensen said in a statement that the loan of The Little Mermaid was part of a cultural exchange between Denmark and China. "I am convinced that she will be an excellent ambassador of Denmark, particularly since the Chinese already are very fond of Hans Christian Andersen and his fairytales," he said in a statement. Her departure from Copenhagen will not leave the harbor empty. Chinese artist Ai Weiwei has created a video installation to be installed at her spot. 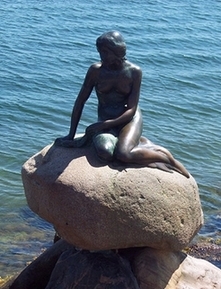 The Little Mermaid& #39;s 165 cm (65 inches) tall sculpture, which sits on a granite block, was created in 1913 by Edvard Eriksen.